Switzerland, this small country in central Europe is probably best known for its cheese, chocolates and watches. Also named Schweiz, Suisse, Svizzera and Svizra, it is a peaceful country that houses two of the top cities with the highest quality of life in the world: Geneva and Zurich. The country is divided by four distinct linguistic and cultural regions; German, French, Italian and Romansh all of which are strongly connected with their neighboring countries. I had the opportunity lo live in the French part of Switzerland for three years, where I had some of the best experiences in my life. The cuisine in Switzerland varies from region to region, and the most popular and traditional dish tends to be cheese fondue, especially during the cold winter. Although nobody can argue fondue is delicious, there are other dishes I would encourage you to try when visiting this amazing country. Fondue aux tomates- This variation of fondue is very popular in the Canton of Valais in the southwest of Switzerland. This fondue is made out of cheese and tomato and is served either with pieces of bread or “pommes de terres” also known as steamed potatoes. The best way to eat this is to cut the potato in half and pour the fondue on top of the potato. 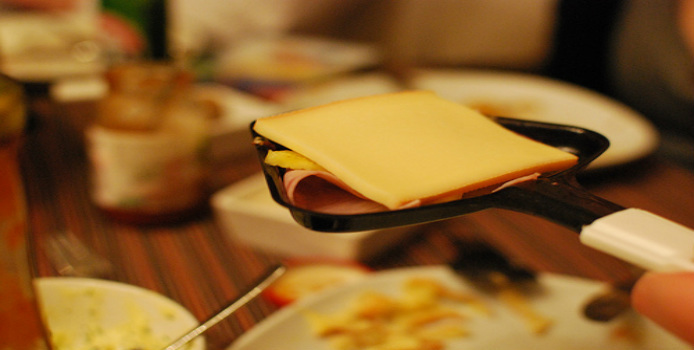 Raclette- From the French word “racler” which means to scrape. This popular dish is made up of pieces of cheese which are melted either with fire or in a special machine, and then scraped on the plate. The cheese is accompanied with steamed potatoes, dried meat or pickled onions. During the winter, many restaurants offer raclette tastings with different types of cheese from emmental to gruyere, for guests to enjoy. Drinking wine is recommended when you eat raclette so it breaks the grease making digestion easier, trust me on this, I wish I had known the first time I tried raclette. Vin Chaud- If you visit Switzerland during the cold months, hot wine is a must to stay warm. This is a secret Swiss people enjoy to stay warm during the frigid temperatures. Hot wine is prepared with fruit and cinnamon and is served in bars, restaurants and ski resorts, equivalent to a hot cider or ponche. Its the perfect drink for apres skiing while hanging out with close friends. There are certainly other interesting dishes in Switzerland that are more influenced by German and Italian cooking. Hope you enjoy these dishes next time you visit the alps! Lily Ong	el 07 de agosto de 2015 a las 21:49 09Fri, 07 Aug 2015 21:49:32 +000032.